Divide the dough into 6 equal pieces. Form each of the pieces into ropes. If you have not done this before, follow the instructions in our post on making an Epi. Stretch the ropes to about 15 inches long. Join the ropes at the top by pinching the ends together. Start by taking the piece on the outer right-hand edge and draping it over the tops of all the ropes. Now bring the second piece on the left-hand side (see picture above) and fold that into the middle (see picture below). These first few steps get things going, and then you will start to see a pattern form…. Take the second piece on the left-hand side and drape it over the top (see pictures above). Take the top piece on the left-hand side and bring that to the middle (see pictures above). Take the second piece on the right-hand side and drape that over the top (see pictures above). Take the top piece on the right-hand side and bring it to the middle (see pictures above). You will end up tucking them up under the end, so no one will ever know if you have to cheat a little. 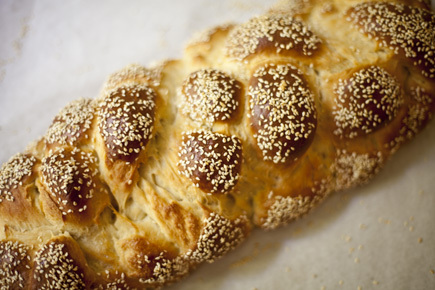 Place the braided challah on a cookie sheet lined with parchment. Dust with a little flour and cover very loosely with plastic. Let the loaf rise for 90 minutes. Preheat the oven to 350°F, with a rack in the middle of the oven. Sprinkle the loaf with the seeds. Bake for about 40 minutes or until the loaf is golden brown and firm to the touch. 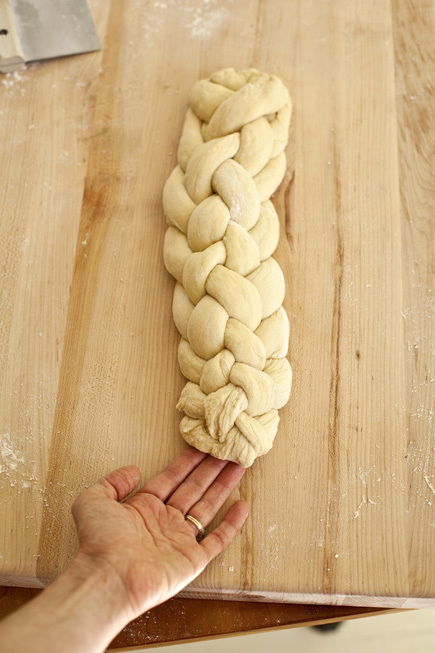 Depending on how high vs wide your braid is, you may need to bake it for an additional 5 to 10 minutes. Allow the loaf to cool completely before slicing. Enjoy! I’ve been wanting to try making Challah. This post is perfect! And absolutely beautiful. This is my new favorite bread, it is both beautiful and so tasty! How beautiful! I’ve made the callah recipe from your first cookbook and loved it! I owned all of your books. You and Jeff rock!!! Wonderful post, we’ll certainly be making this for yontiff. Thanks so much. It’s always interesting to see how others do the six strand braid. I do mine a bit different, but in the end it looks the same. I guess we all stick with what we first learned. The advice I’d give those new to multiple strand braids….FOCUS..and don’t stop once you start!! It only takes a couple of minutes at most to do the braid…but if you stop to answer a question or the phone…you’ll be unbraiding and starting over!! I have and frequently use all your books!! Fantastic method!! Help! After hearing me go on and on about your book my sister finally bought HBI5 and started using it. She just mixed up a batch of the Soft Whole Wheat Sandwich dough and accidentally put it straight in the fridge without the initial rise on the counter. She says it looks like it rose in the fridge after two hours but wonders if she should still use the dough. Is there anything she should do to try and fix her mistake (like take it out for a rise on the counter before shaping it, etc?) Thanks! Cyndi: If you start with warm water, you often get nearly full rise even if you go straight to the fridge– it takes a while to cool off. She doesn’t need to discard this dough– at the very most, all she needs to do is take it out of the fridge, warm it to room temp, then shape and use as usual. Then back to the fridge. If it doubled or so, she is set. I got the HBin5 book about a week ago, and I’m having such a good time with it! I’ve used up my first batch of the master recipe with a couple of boules and some flatbreads. They were lovely! However, I take care of my 91 year old mother and those crusts are just too hard for her to chew. Last night I made up a batch of the milk and honey raisin bread, but without the raisins. I baked a couple of experimental rolls with it this morning and they were perfect — nice and soft. I don’t have room in the fridge for more than one batch of dough at a time, but I love making pitas. Will they work at all with this enriched dough? Maybe a lower oven temp and longer time? Betty: Yep, pitas work w/enriched dough. You may not need to lower the temp by much, since the baking time isn’t long enough to burn the eggs/sweetener. Experiment a bit and see what you think. i just made the Challah and it came out really nice – I did goof up the braiding but it’s going to be fine. Before I make the second one, I’m going to practice with string first! I have what may be an SOS. I made up a batch of the challah 5 hours ago and am still waiting for it to flatten/collapse on itself! It is still rising and about to touch the top of my 6L round Cambro bucket. Used only 1/2 the amount of yeast (regular). Should I let it keep rising, refrigerate it, other??? Thank you! P.S. Of course, I will refrigerate it, but didn’t know if I should go ahead and do that now, even though it is still rising. L: Just go ahead and refrigerate it. It’s ready, don’t know why it won’t flatten but it doesn’t matter. It’ll continue to rise slowly in the fridge if it has more potential to do so. Jeff – Thank you for your reply. The challah turned out wonderfully. Beyond wonderfully! I didn’t braid it, but put it in a borosilicate container (made originally for quick bread recipes) and baked it in the crockpot! * Minus the beauty of the braid, it was to die for. (Buttered the borosilicate container for release and so the bread has a lovely darker, soft crust.) 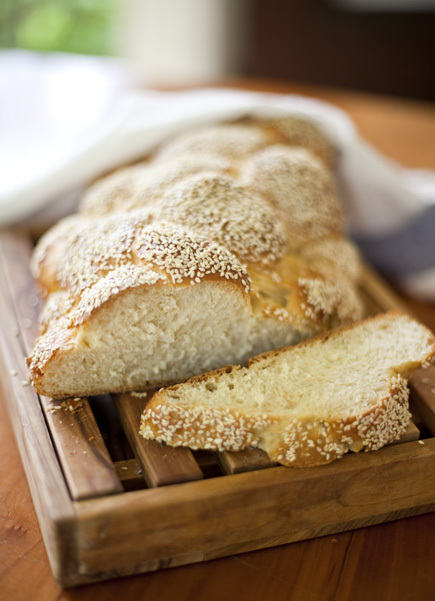 This has become our very favorite crockpot bread! Rolls turn out great, too. *Posted about baking the challah recipe in the crockpot in the crockpot section. Hope you’re having a wonderful week! I have ABi5 and APi5 and the challah is my favorite recipe so far! The bread is rich and delicious and also makes excellent cinnamon rolls. I am making yeast rolls with the master recipe today. Thanks for the great books that make bread-baking accessible to the everyday working consumer! I have challah dough (made with duck eggs!) in my fridge from 7-8 days ago. I know your recommended max storage for enriched doughs is 5 days. What happens if I bake my 7-8 day-old dough? Will it just taste bad? MB: No one really knows– results may get dense after 5 days when there’s egg in the dough. If you’re asking about food safety, I can’t find a reference that gives a maximum safe refrigerator storage time for eggs-based doughs or batters. I’m guessing that the taste will be just fine. Usually we say freeze those doughs if you’re keeping them longer than 5 days. Hmm, well I may just experiment and see! Will let you know what comes of my “aged” challah dough. Update: 9 day-old refrigerated challah dough baked up just fine! No funny taste, good texture and crumb, no food poisoning symptoms (at least not yet)! 😉 When I was shaping the dough to form the gluten cloak I got a hint of a sourdough-ish smell, like I get with my non-enriched doughs that can store for up to 2 weeks. The aroma didn’t come through in the finished product at all, however. This post is from a couple of years ago, so it had the link to the original version of Artisan Bread in Five; I’ve updated that, see above. Both the original and the “New” have the basic white challah dough (though not the six-strand directions). “Healthy Bread in 5” has a version that’s almost 2/3’s whole-grain. I’m very excited because my 6 braid challah, based on your recipe, won 2nd Place at the Ventura county fair! My Norwegian sweet bread, based on the raisin challah recipe, won 3rd Pl. My fresh strawberry bread with meringue icing won 1st place! My challah recipe is half honey and half sugar. It’s enough sugar to give it that sweet and clean sugar taste, with honey for moisture. I have an opportunity to teach at Chabad again. I’d like to be able to use at least 5 pounds of flour, so we can make the blessing. I know I can double the recipe, but that’s 4 pounds, 4 ounces. Can I make a batch that’s 2 1/2 tines the regular recipe, without getting into problems? Thank you very much. Luv ya guys!!! Congratulations, that is so wonderful! Yes, you can increase the recipe by 2 1/2 times without issue, but I do recommend doing it by weights, as you probably do already. I do bake by weights. Thank you Zoe! The event is Sep 4, in time for Rosh Hashanah baking. The Rebbetzn will be thrilled that we can use five pounds of flour!!! I got a flash of inspiration today. Remember the woven basket you made by baking over a metal bowl? Well, I’m going to be teaching bread shaping. I am probably going to teach bird rolls. Your basket will be an upside down crown that will become a nest for the bird. Looking forward to making the dough and practicing! This sounds so awesome, I can’t wait to see what you create!